All on 4 implants procedure offered at Lane Ends Dental Practice in Preston can give you your desired set of teeth in a day using just four implants. These Same day teeth Implants are an option to replace missing teeth. A full set of beautiful teeth can naturally boost a person’s confidence, and improve quality of life by providing ease of eating and talking, which most of us take for granted. A set of teeth is usually replaced by the placement of a denture or implants. Traditional dental implants require between six and eight implants to support an arch of teeth. With the Same Day Teeth, we only need to use four , which makes the procedure much less invasive and far quicker than traditional treatment.Through the use of a minimum 4 implants you can have a whole new smile, completed in just one day. Same day teeth eliminate the need for ill-fitting dentures as teeth are fitted immediately onto the implants, removing the temporary stage. The implants are strategically placed in areas of the jaw where bone is denser and stronger; because of the need for solid foundations the 4 dental implants can only be used in the lower jaw, whereas at least 6 dental implants are needed for the upper jaw. During your appointment, we’ll place two implants at the back of your mouth at a 45 degree angle. The other two will be placed at the front of your mouth at 90 degrees. This exact placement means your new teeth will receive optimum support and will reduce the length of the healing process. 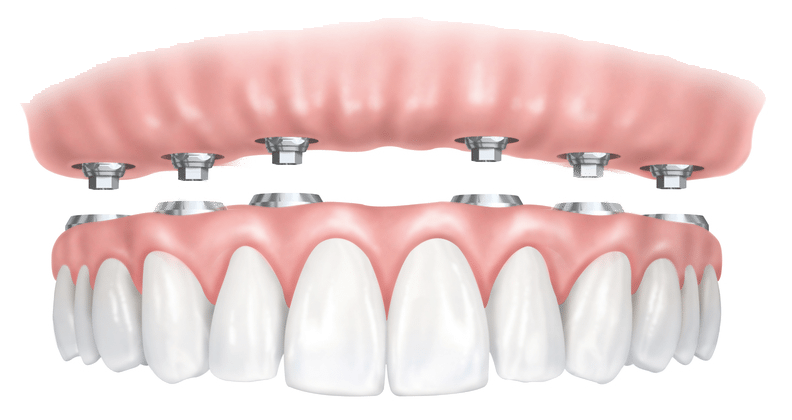 The use of a minimum 4 dental implants allows the bridge to be fixed and treatment completed in just one day. The bridges used on Same Day Teeth implants are extremely durable with patients able to treat them like natural teeth. Same Day Teeth treatment is highly beneficial because you’ll have new teeth fitted in just one day, so you won’t have to wait a minute longer to enjoy a fully functional smile. It’s also worth noting that there is rarely any need for bone grafting with the Same Day Teeth procedure. These implants create a beautiful new smile in addition to restoring functionality to your mouth. After your consultation with our implant dentists, a full jaw radiograph (panoramic x-ray) and possibly a CT scan will be taken to examine the amount and location of bone in your jaw. This will allow us to diagnose if there is enough bone length, width and density to securely place an implant. A thorough examination will also be performed to check that there are no problems present in the mouth before starting your implant therapy. Placement of the four implants is the same as normal implant procedures. Treatment is carried out in a near sterile environment. The operation is carried out under local anaesthesia and is pain-free. The implant fuses with the natural bone over time. This process is called osseointegration and gives the replacement teeth full stability. Two of the implants are placed at the front of the mouth, taking advantage of the dense jaw bone existing there. The two implants at the posterior of the mouth are fitted at forty-five degree angles to allow maximum stability and take full advantage of the stronger bone in front of the jaw .There is no need to wait for the mouth to heal before placing bridges or dentures on the implants with All-on-4 implants, so the patient leaves the surgery with a full set of functional and beautiful teeth. When your implants are in position, we will attach small devices known as abutments to them. This is so the implants can be connected to your provisional restorations. You’ll need to come back for regular appointments after the implants are placed. This is so we can keep an eye on your progress. The implants will take around six months to fully integrate with the bone. After this time, your permanent restorations can be fitted.